What made you pursue a career in footwear design? I've always loved shoes – ever since I was really young, a new pair of shoes was the biggest treat to me. Every birthday and Christmas, shoes were always at the top of my list and it's not all that different now! What made you decide to focus on bridal footwear? I happened across the wedding world almost by accident. After graduating from university, I made some ivory, embroidered silk shoes which looked quite bridal and as a result, some of the wedding industry's press featured them. Then, the editor of Wedding asked me to make her bridal shoes. They were featured in the magazine and the day after it hit newsstands, my answerphone was full of messages from brides wanting to order a pair. I've never looked back. What led you to collaborate with Rainbow Club? Working with Rainbow Club was like a meeting of minds really. I met with Richard Marsh the managing director and got on so well with him that it just made sense – we have the same outlook on the bridal world. The label wanted to incorporate a more luxurious range into their collection and I was keen to work with them. What inspires your designs, and has there been a key influence behind your most recent collection? Inspiration comes from so many places and things, I love to visit museums and look at the beautiful details on period shoes and clothing but I'm also inspired by what's on the catwalk. I love rummaging in antique shops and vintage clothing stores. The small details are so important to me, from beautiful pearl buttons to delicate handmade flowers. Which footwear designers do you admire? I absolutely love Rene Caovilla pieces for their sheer elegance and beauty, and British designer Sophia Webster for her cartoonish sense of fun and flamboyance. Which piece from your collection is your favourite? In the current collection I love Primrose, a pretty lace peep-toe sandal with a delicate organza ruffled edge. It's so pretty on the foot and looks great with most dress styles. 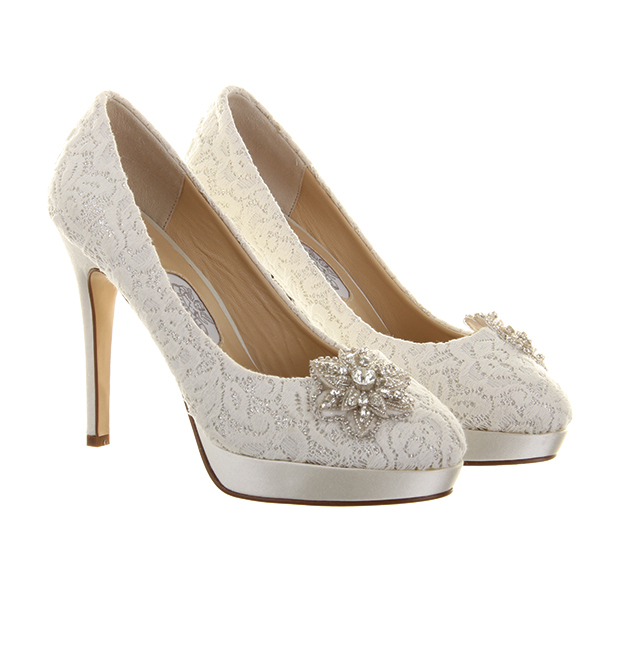 What tips do you have for brides looking for their big-day shoes? I always advise brides to splash out and go for really beautiful shoes. After all, this is their Cinderella moment and they should spoil themselves. It's so easy to say “well, no one will see my shoes,” but your guests will, and the accessories finish the look. If you're wearing beautiful shoes you will feel beautiful. On a more practical note, I suggest that you wear the chosen shoes in a little, if at all possible, and choose a heel height you can comfortably wear for a long time. If height trumps comfort, get two pairs for the big day – a pair of heels and a pair of flat pumps. If you could design wedding shoes for any famous bride, past or present, who would it be? Historically, it might be a cliché but I'd love to have made shoes for Audrey Hepburn or Sophia Loren, they both epitomise femininity and come from an era I admire, which was all about elegance and glamour. I'd also love to make shoes for Demelza from the new version of Poldark. She's beautiful, with her porcelain skin and red hair and is also very feisty, which I love.